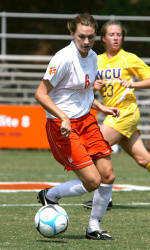 Clemson, SC – The Clemson women’s soccer team will play host to Florida State on Thursday night at Riggs Field. The Lady Tigers, ranked 25th nationally, will meet the 15th-ranked Seminoles in a 7:00 p.m. contest. Clemson has an 8-3-5 overall record and a 1-2-5 mark in the Atlantic Coast Conference. The Lady Tigers are coming off a 1-1 double-overtime tie against Miami in Coral Gables, FL last Saturday. Seven of Clemson’s last eight consecutive games, all of which have been played against ACC opponents, have advanced to double overtime. The Lady Tigers have a 1-1-5 record in those contests. Senior All-American goalkeeper Ashley Phillips needs just two saves to break the Clemson career saves record of 305 set by fellow All-American Katie Carson from 1998-2001. Phillips currently has 304 career saves, 66 of which have been recorded in 2007. Phillips has allowed just 11 goals in over 1361 minutes of play this season for a 0.857 save percentage and a 0.73 goals-against average. Three Lady Tigers have 13 points apiece to lead the team in scoring. Senior Nuria Zufia has six goals and one assist and freshman Samantha Fortier has five goals and three assists on the season. Sophomore Molly Franklin has two goals and an ACC-leading nine assists for Clemson. Florida State is 10-4-3 overall and 5-2-2 in the ACC, most recently tying Duke 1-1 in double overtime in Durham. The Seminoles are led in scoring by Mami Yamaguchi with 17 goals and eight assists for 42 points. Goalkeeper Erin McNulty has 53 saves and has allowed 17 goals in 1450 minutes in goal for Florida State. Clemson has a 7-8-2 record in the series against Florida State and holds a 5-3 advantage against the Seminoles in games played at Riggs Field. The Lady Tigers met the Seminoles twice last season, with the first contest ending in a 0-0 double-overtime tie on the road during the conference regular season. The teams met again in the 2006 NCAA Elite Eight, with Clemson falling 2-1 to the Seminoles in Tallahassee. Thursday’s game between Clemson and Florida State will be broadcast live on the Internet via ACC Select. Fans can watch the action by clicking on the link below. For more information, visit ACCSelect.com. Watch Clemson vs. Florida State Live! Live statistics for the Clemson vs. Florida State game will be available on www.clemsontigers.com. The statistics can be accessed by selecting the corresponding Gametracker link in the schedule window on www.clemsontigers.com.